Melanie is Regional Clinic Manager at Bay State Physical Therapy. She attended Northeastern University where she earned her Doctorate of Physical Therapy as well as her B.S. in Rehabilitation Sciences. Her clinical experience includes outpatient orthopedics, home care therapy, and inpatient orthopedic trauma. Melanie treats patients of all ages and ability levels both on land, and with aquatic therapy in Weymouth’s warm water therapy pool, in an effort to maximize patient outcome. She is certified in the Graston Technique, which is a patented form of instrument-assisted soft tissue mobilization that enables her to effectively detect and treat scar tissue and restrictions that affect normal function. She is an A.C.E, Aline Certified Expert, skilled in assessing and fitting semi-custom orthotics that focus on aligning the body. Melanie is also an APTA credential Clinical Instructor, and takes her passion for teaching to the next level working with doctorate level students from many schools around New England. Her own quest for knowledge is relentless as she constantly seeks out continuing education always striving to learn the newest cutting edge techniques in the field. Besides managing and treating she also sits out Bay State’s Continuing Education committee and Compliance committee. Melanie believes in treating the whole person, not just the impairment. She works closely with our interdisciplinary team including chiropractors, personal trainers, nutritionists, and massage therapists here at the Weymouth Club. 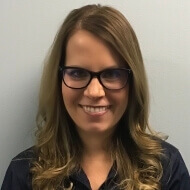 Melanie has ten years of cheerleading and coaching experience and uses this to aide her functional approach to orthopedic rehabilitation with an emphasis on patient education. In her free time she enjoys staying healthy and active, volunteering, and playing with her 3 rescue dogs.